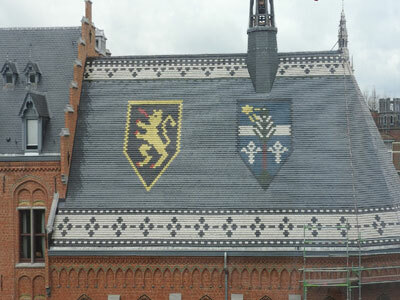 The Leuven University in Belgium had commissioned a major refurbishment of its main roof. 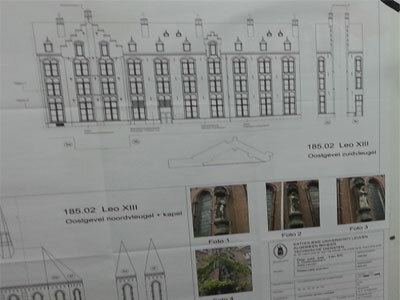 This particular building within the university complex is a UNESCO World Heritage site so it was very important the tile material selected would suit both the original building and the local vernacular. An additional complication was the tiles used needed to be glazed in different colours to create a coat of arms detail on the roof. 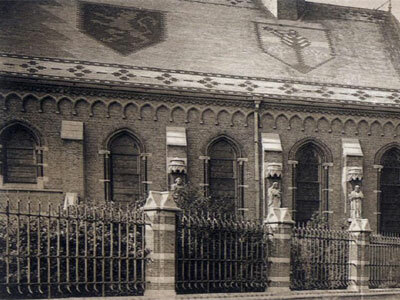 None of the local manufacturers were able to supply suitable products so the Architect contacted Heritage Clay Tiles. We worked closely with both the Architect and the client to guide them through a multi stage selection process. The process culminated with the supply of pre-production RAL colour swatches. The swatches were approved to and we produced a pallet of bespoke, glazed handmade tiles which met the exacting standards of all the regional authorities involved. Heritage Clay Tiles project managed the contract closely and liaised with the contractor to ensure the tiles of each colour were delivered on time and in the correct sequence. The new roof is now complete and has provided the University with a stunning new talking point while respecting the rich history and heritage of the building.